This adorable slanted Danish midcentury modern bookcase I recently found antiquing (for a whopping $30!) is brilliantly residing in my new home’s long hallway. 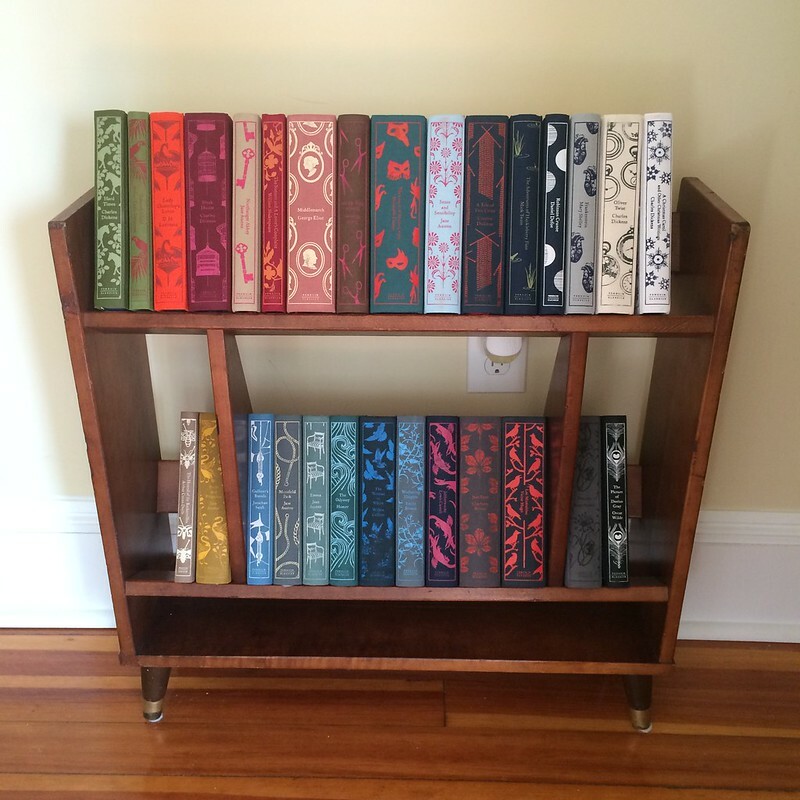 It’s also the perfect place to house my ever-growing Penguin Clothbound Classics collection, which are, in my humble opinion, the most gorgeous book designs. What do I do when this little bookshelf can’t house them any longer in one nice set together? There’s nothing better than eating fresh, local produce in summer. 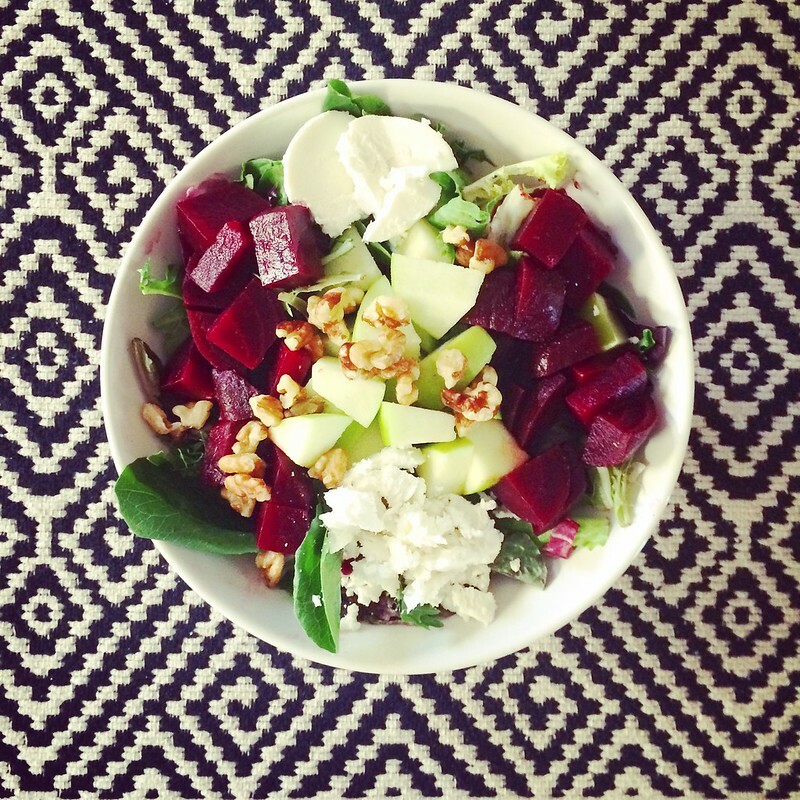 Here’s my weeknight dinner: mixed greens, local goat cheese and roasted beets, as well as a bit of granny smith apple, walnuts and a blush wine vinaigrette. Doesn’t get much better. My mum was ferreting around in her basement and inside the old dark room and tool shop room my dad used to use, she found a rusted out utility stool that was clearly left behind by some workers 20 years ago when my parents had their house remodeled. It was in rough shape, having sat in that dark basement for decades. She offered it up to me as a great place for someone to sit in my new kitchen when I’m cooking, or as a plant stand, if I was willing to do a little work on it to get it in shape. All it took was about 20 minutes of sanding off all the rust and splattered paint, then cleaning it with a firm bristle brush. Once that was done, I slowly spray painted it in stages with a great jade green color, which we happened to have two cans of lying around in the garage for some unknown project. Alas, after about two hours with this little stool, it was brought back to life. It now resides in my kitchen, the home of my large jade plant. But, it will be a great spot for someone to sit and have a drink while I’m cooking up some dinner. I also love that, while these are pretty popular these days, I didn’t have to spend a ton of money on one sold by some store–some sell updwards of $150. What’s more, when my mum and I were recently antiquing in New Hampshire, one shop had several of these stools, as rusted out as mine, for sale for a whopping $70. 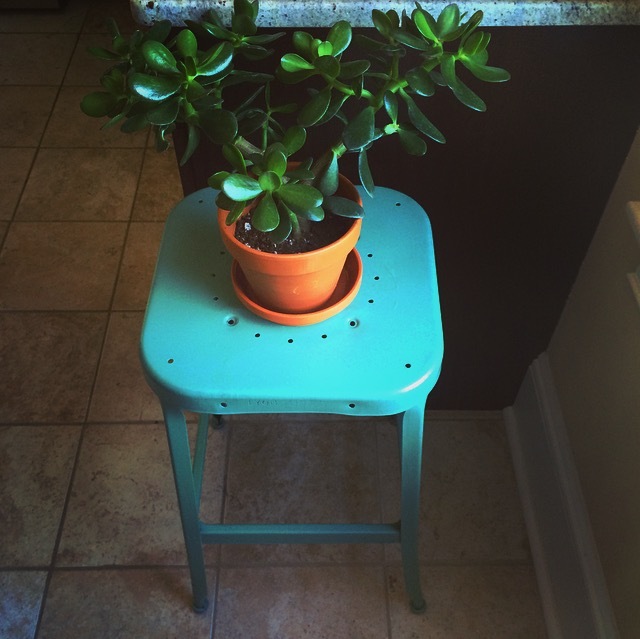 I’m so excited to have scored this stool for free, and barely any work to get it to where it is now. Recycling is the best, no? 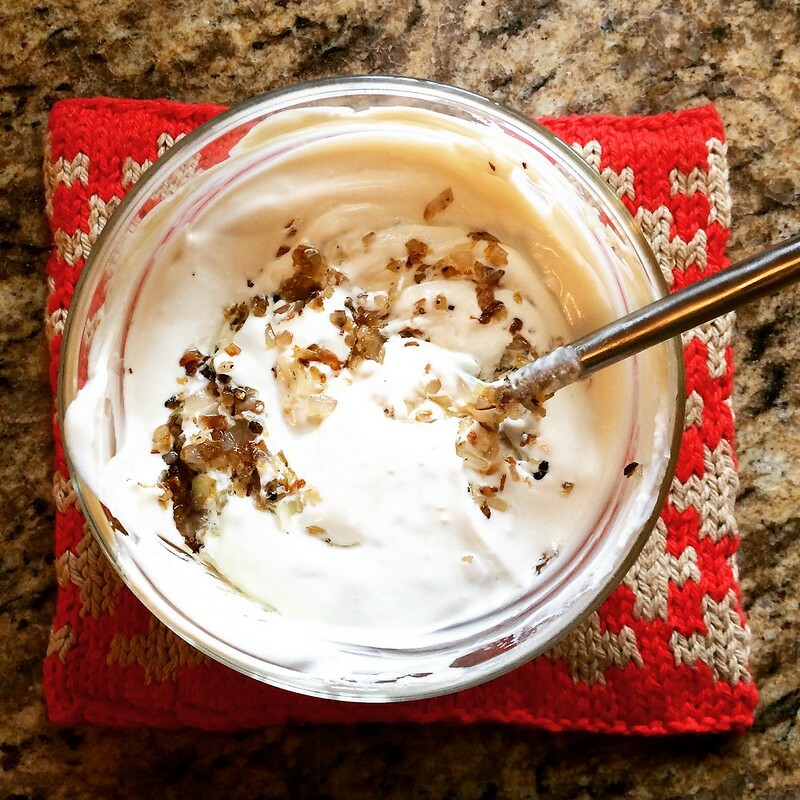 caramelized shallot / greek yogurt. You know how there are plenty of things not worth making at home? That don’t reap homemade rewards? Like my brilliant little project this winter to fret under the endless cutting of tiny conversation hearts? Well, onion dip does not fall into that category of its not better than the store bought. This onion dip uses plain greek yogurt and shallots; but I did one small modication. Martha tells you to just chop and add, but I decided it would taste better if I caramelized the shallots in olive oil, with salt and pepper. I think it made all the difference. 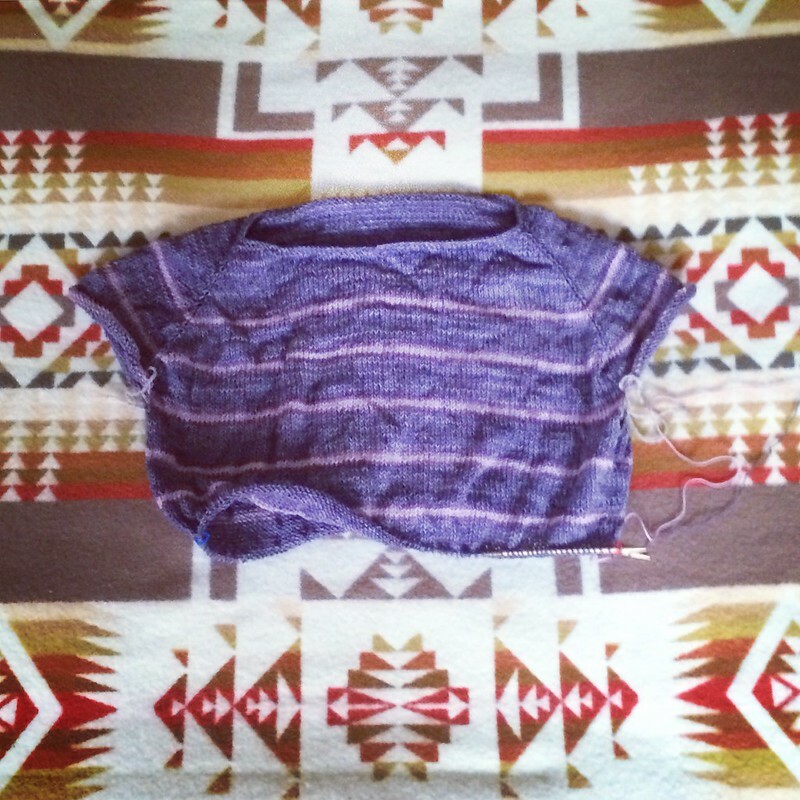 This is my Transmute pullover, which I have been working on since March. It’s my only knitting project these days. I’ve been more concentrated on getting my new home in order, doing DIY projects to furniture and other antiques, and working on smaller scale projects like cross stitch, then my usual mainstay: knitting. Lately, I’ve been thinking a lot about the maker movement, the maker community, and the making. I am indebted to parents who taught me the value of exploration with hands, and that having hobbies is life’s most important adventure. I hold true to those values and want to practice in those as much as I can. But, I don’t want to just make for the sake of making–that pattern everyone MUST knit right now, I don’t feel tied to, or obligated to, any longer. I used to have the urge; everyone knit an “Amanda” cardigan, does that mean I need to have one, too? Transmute is my homage to my new attitude toward making. Make what you want, but don’t feel the need to churn out project after project. Take extended breaks if need be; its healthy. Choose one thing to focus on for awhile, rather than having 10 projects going at once. And so, Transmute is my current project, knit up using some Plucky Knitter Feet in the Good Ole Pip colorway for the main, and some Shi Bui sock I had laying around without a skein mate. I really love the subtle color difference between the purply gray and the pink–it’s not something I’ve seen before. That’s what I want my making to be; unique. Snaps when its finished. I’ll be bringing it on my road trip right after Pitchfork Festival, which I’m sure will boast plenty of time for miles of knitting.